Why Do Organizations Need Zip Code Data to Succeed? Why did I build RealZips for Salesforce? More and more businesses are turning to Salesforce to manage their customer relationships. The payoff is amazing - since organizations can finally get a single view of their customer data - and connect faster with their customers! However, rapid-growth companies are now realizing they need to structure existing CRM data. They go deeper into CRM data - adding a solid foundation of geographic data beneath their existing CRM data - to better serve their customers. Above the surface, your team is using the standard CRM data every day to close more deals, find more customers, run marketing campaigns, manage opportunities, run customer support and much more. Unfortunately, all these daily tasks are not supported by a solid data structure that automatically makes it possible to organize and prioritize workflows, such as where to market, which customers to visit first, plus figure out which cities need additional sales and support resources. Let the RealZips app automatically structure the CRM data into geographic structures such as time zones, states, metro areas, counties, sales regions, and territories. From that moment - your CRM data really comes alive - allowing you to improve search capabilities, reports, and dashboards for your team. Add deep market data and run comparisons against customer data. Your team can now discover geographic areas where they will have their greatest growth opportunity. We’re seeing companies improve marketing and sales strategies with RealZips. They used to put too many resources into geographic areas with too low potential, while leaving areas with high market potential open for their competition. 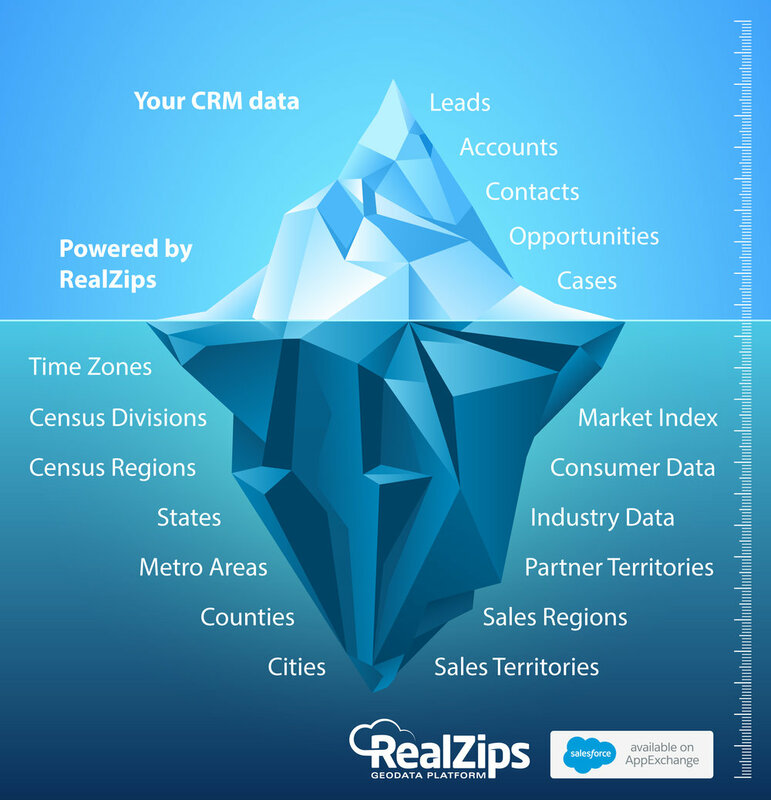 With the RealZips app in their Salesforce Sales Cloud - these companies are now driving success thanks to fingertip access to geographic data structures and market data previously invisible to their team members.